Celine Hin (PostDoc 2009-2011) shares her memories of Millie as an advisor and a friend. 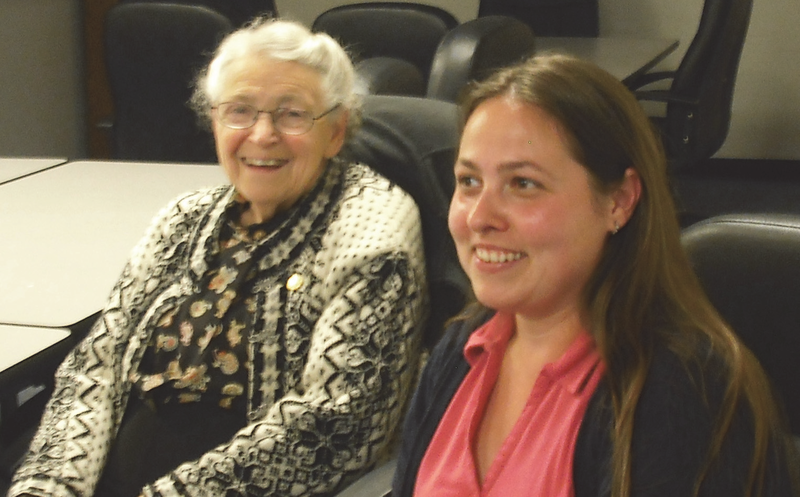 Professor Dresselhaus was my advisor at MIT, and later, she became my friend. I will always remember when we shared the same room at the American Physical Society conference. It was always a great time. She talked to me about research, family, life… I was lucky and I knew it. We developed a new approach to predict the solubility limit of solute atoms in a binary alloy using a Kinetic Monte Carlo algorithm. The idea is to use the interface energies calculated by first-principles calculations to parameterize the pair interaction energies used in the Kinetic Monte Carlo algorithm. In order to validate this method, it was tested on a very well known case: the Ni-Al alloy. We found that the calculations are in very good agreement with the previously calculated phase diagrams. A kinetic Monte Carlo algorithm with a vacancy source and sink has been developed to determine the equilibrium vacancy concentration in Si1−x Px alloys. KMC results for the equilibrium vacancy concentration exhibit good agreement with the Lomer formula with added entropic terms to account for high P concentrations. They also highlight the role of equilibrium vacancy concentration and clustering on self and impurity diffusion during thermal aging. Professor Dresselhaus has had a big impact on my career by opening the door to the physics world for me. My research topics have evolved. Condensed matter physics is an important part of my current research.